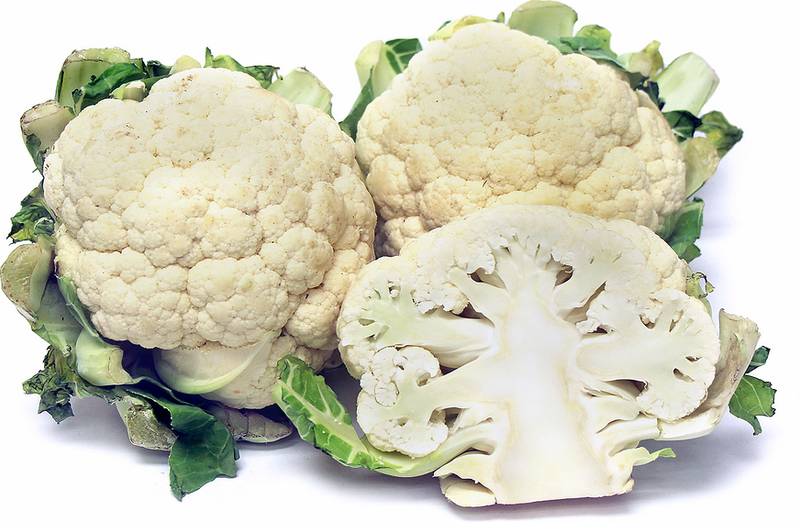 Cauliflower is made up of tightly bound clusters of florets that form a dense head, similar to that of broccoli. Resembling a classic tree in shape the clusters sprout from stems which are attached to a singular central white trunk. The stems and trunk are firm and tender and the florets have a dense yet soft and crumbly texture. Its flavor is mild with subtle cruciferous and nutty sweet nuances, a taste which is amplified when roasted. The entire cauliflower, its leaves, trunk, stems and florets are all edible. Cauliflower is available year-round with sporadic gaps. Cauliflower, botanical name Brassica oleracea var. botytis, belonging to the plant order Capparales, is a cool season biennial. Unlike broccoli, cauliflower does not ordinarily develop side shoots, hence it must be harvested properly and consistently before it matures. Cauliflower is high in both fiber and vitamin C, with a half cup of florets providing nearly half of ones daily requirement for vitamin C. It also contains a fair amount of vitamin A, folate, calcium and potassium as well as selenium, which works with Vitamin C to boost the immune system. Cruciferous vegetables such as cauliflower are touted for their high levels of cancer-fighting phytochemicals know as glucosinolates. Recipes that include Cauliflower. One is easiest, three is harder.